There's still time to enter a grilling contest being held by Mario Batali and Rachael Ray. 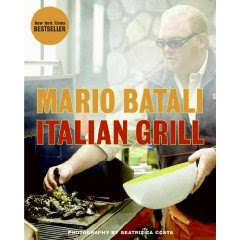 Mario recently published a grilling cookbook, called Italian Grill, and as part of his promotion of that book, he's hosting a grilling contest with Rachael. To enter, you have to submit a grilling recipe and a video demonstration. The prize is (drumroll, please) a " once in a lifetime VIP weekend at Texas Motor Speedway including the ultimate pre-race tailgate party with Mario Batali and Rachael Ray at the Dickies 500 NASCAR Sprint Cup Series race on November 2nd." And, in case you think you might enter and lose for no reason, have no fear! Uncle Bens will donate $1.00 to The Food Bank For New York City for every entry received.